Each child’s health form must be filled out BEFORE they begin school. 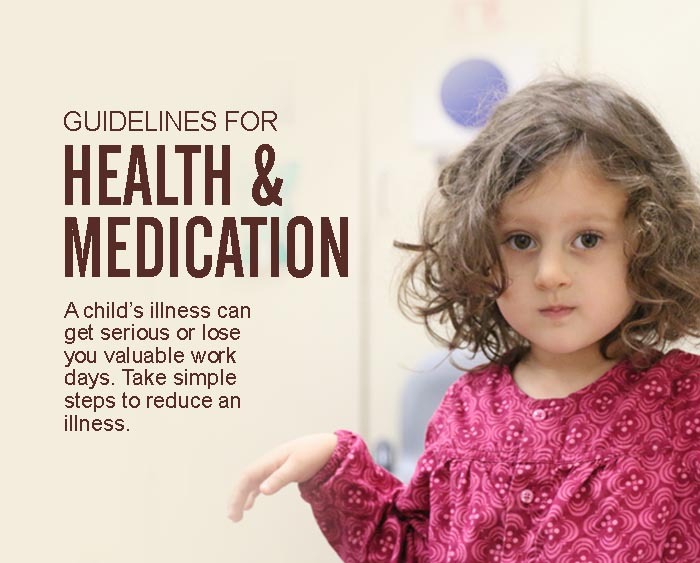 State law requires your child’s medication to be in the original prescription container with written instructions and a signed release permitting staff to dispense the medication. The medication must be delivered to the classroom teacher by the adult, not the child. Do not send your child to school on days when any of the following symptoms are present: fever, rash, cough, diarrhea, vomiting, discharge of mucous from nose or eyes. Signs of illness may be non specific. The child may look and act differently. There may be unusual paleness, irritability, unusual tiredness or lack of interest. Antibiotics prescribed until the medication has been given for at least 24 hours. Many illnesses are considered non contagious after administration for 24 hours. Please ask your physician specifically and relay this information to the center's staff. Any new medication, never prescribed before, should be given for 24 hours before returning to the center. Get an air purifier for the home. Braggs Organic Apple Cider - At the first sign of an illness dilute 1 tsp of organic Braggs Apple Cider Vinegar in a half a cup of warm water. If given early enough it works wonders. CONJUNTIVITIS which is an eye infection commonly reffered to as “pink eye“. The eye is generally red with a burning sensation and there is thick yellow drainage secreted. The eye may get stuck after sleeping. RASHES that you cannot identify or that have not been diagnosed by a physician. BRONCHITIS: This can begin with hoarseness, cough and slight elevation in temperature. The cough may be dry and painfull, but generally becomes painful. IMPETIGO; A skin condition that shows up as red pimples. These eventually become small fluid filled spots surrounded by reddened area. When the blister breaks, the surface is raw and weeping. DIARRHEA : Watery or greenish bowel movements that look different and is much more frequent than usual. Ths school usually uses a criteria of two diarrhea BM’s before calling the parents for pick up. MEASLES: Incubation period of 10 - 14 days. First symptoms: fever, runny nose, cough, rash. Period of communicability: from cough, runny nose - nine days; after rash appears - five days. GERMAN MEASLES: Incubation period 14 - 21 days. Same symptoms as measles. Period of communicability: four days after start of rash. CHICKEN POX: Incubation period 13 - 17 days. First symptoms - slight fever and rash. Period of communicability: not more than one day before nor six days after appearance of rash. MUMPS: Incubation period: 12 - 26 days. Symptoms: fever, swelling, and tenderness in salivary glands. Period of communicability: seven days before symptoms until nine days after appearance of symptoms. POISON OAK: What can be said? Late at night when you’re sleeping...?!! HEAD LICE: No nits, no lice—clothes, beds, everything and everyone needs the treatment if we’re to prevent infestations.